LBS College of Pharmacy 2, Tilak Nagar, Jaipur - 302004, Rajasthan, India. ABSTRACT: The aim of this study was to develop microspheres based orodispersible tablets of roxithromycin using the solvent evaporation technique. The microspheres were formulated in to orodispersible tablets using direct compression technique by central composite design. The objective of the study was to analyze the effect of concentration of eudragit RS100 (X1) and concentration of polyvinyl alcohol (X2), on the entrapment efficiency of the drug. Tablets were evaluated for physical characteristics viz. weight variation, hardness, friability, disintegration time and in-vitro dissolution study. The hardness and weight variation of the tablet were found 4.7 ± 0.24 kg/cm2 and 346.74 ± 3.74 mg, respectively. Friability of tablets was found 0.54 ± 0.04 which is less than 1% or in the acceptable limit. Disintegration time and drug release were found 45 ± 0.51 seconds and 96.45 ± 2.24% in one hour, respectively. The drug release data were subjected to drug release kinetics study. INTRODUCTION: Orodispersible tablets (ODTs) are also known as “Fast melting, Fast-dispersing, Fast dissolving, Rapid dissolve, Rapid melt, Mouth dissolving and quick disintegrating tablet” 1. The oral route is the most important method of administration of the drug for systemic effect. Oral drug delivery system generally includes substances to mask the taste of the active ingredients. This masked active ingredient is then swallowed by the patient's saliva along with the soluble and insoluble excipients. Advantages include a possible bypass of first pass effects and avoidance of systemic elimination within the gastrointestinal tract. Although they offer advantages because of poor patient acceptability associated with this site, they are preferred for the local application rather than systemic application 2. The oral cavity is highly preferred as a route of administration as the mucosa is permeable with a rich blood supply 3. Microspheres are multi particulate drug delivery systems which are prepared to obtain prolonged or controlled drug delivery to improve bioavailability, stability and to target the drug to a specific site at a predetermined rate. They are made from polymeric wax or other protective materials such as natural, semi-synthetic and synthetic polymers. Microspheres are characteristically free flowing powders having a particle size ranging from 1-1000 μm consisting of proteins or synthetic polymers 4. Roxithromycin is a macrolide antibiotic. Roxithromycin prevents bacteria from growing by interfering with their protein synthesis. Roxithromycin binds to the subunit 50S of the bacterial ribosome, and thus inhibit the translocation of the peptides, it is more effective against certain gram-negative bacteria, particularly Legionella pneumonia 5. Therefore, the purpose of the present study was to develop an orodispersible tablet of Roxithromycin by direct compression. Such tablets should disintegrate rapidly in the saliva without the need of water and release of drug instantly for immediate therapeutic effect. Materials: Roxithromycin and eudragit RS100 were obtained as a gift sample from Grampus Laboratories and Evonic Industries, India. Dichloromethane was supplied by Rankem, India. Microcrystalline cellulose, mannitol, sodium starch glycolate, magnesium stearate, talc, lactose, disodium hydrogen phosphate, potassium dihydrogen phosphate were purchased from Loba Chemie, India. All other ingredients were of analytical grade and were used as received. Optimization of Formulation: Batches were formulated according to the Central Composite Design (CCD) to study the effect of different variables on the entrapment efficiency of the drug. For the formulation, 2 factors were selected, containing 3 levels each. Factors are shown in Table 1 and 13 formulations were formed according to CCD. Preparation of Roxithromycin Microspheres by Solvent Evaporation: The microspheres were prepared by solvent evaporation method. In the organic phase, roxithromycin and polymer were dissolved in 20 ml of dichloromethane (DCM), shake well and sonicated for 15 min. In the aqueous phase, PVA was dissolved in 100 ml distilled water. The organic phase was injected into the aqueous phase at a low stirring speed (200-600 rpm) on a magnetic stirrer for about 1 h until all the dichloromethane evaporated. Microspheres were separated by filtration, through a Whatman filter paper and dried at room temperature for 24 h 6. Dried microspheres were stored at 37 ºC. Percentage Yield, Entrapment Efficiency, and Drug Loading: The drug loading and entrapment efficiency of microspheres were estimated by dissolving 200 mg microspheres powder in 20 ml phosphate buffer pH 6.8 and sonicated for 10 minutes, filtered and volume was made up to 100 ml and analyzed by UV spectrophotometer at a wavelength of 205 nm. Formulae for calculation are given below 7. Particle Size Analysis: Particle sizing analysis was carried out by using Microtrac S 3500, USA instrument. Distilled water was used to prepare the samples. The flow rate was maintained at 75 cycles per minute and ran for 10 sec. Particle size was recorded as cumulant diameter 8. Scanning Electron Microscopy (SEM): The morphology and surface appearance of microspheres were observed via scanning electron microscope (Carl Zeiss EVO 40, Cambridge, U.K). The microspheres were placed on metal stubs using double-sided carbon tape and coated with gold to a thickness of about 450 Å using sputter coater for gold coating (Polaron SC7640, U.K) and visualized under scanning electron microscope 9. Differential Scanning Calorimetry (DSC) of Optimized Microspheres: DSC measurements of RMS-9 were carried out on DSC Q10 V9.9. The instrument was calibrated using indium as standard. Samples were placed in sealed aluminium pans and heated from 30 °C to 200 °C at the rate of 10 °C / min under the nitrogen atmosphere (50 ml/min) with an empty pan as the reference. In-vitro Dissolution Rate Studies: In-vitro dissolution study of microspheres was carried out in USP dissolution apparatus type II in 900 ml phosphate buffer (pH 6.8). The temperature was maintained of 37 ± 0.5 °C, at a speed of 75 rpm. Samples of 10 ml were withdrawn, replenished with fresh medium at predetermined intervals and analyzed by using UV spectroscopy at 205 nm 10. Roxithromycin Oro-Dispersible Tablets Preparation: Roxithromycin oro-dispersible tablets were prepared by direct compression method. The tablets were prepared using super disintegrant (sodium starch glycolate, avicel), mannitol as a diluent, lactose as a sweetening agent, talc with magnesium stearate as a flow promoter. The optimized microspheres (batch RMS-9) and other ingredients were mixed together and then blended in a tumbling cylindrical blender with talc, and magnesium stearate and compressed into tablets using a 7.6-mm punch single-tablet machine. Compressibility Index: It was calculated by using the Carr’s compressibility index as given in equation 4. Where TD is tapped density and BD are bulk density. Evaluation of Orodispersible Tablets: Evaluation of mouth dissolving tablets means a process of systematically assessing the quality or efficacy of mouth dissolving tablets by studying various parameters in accordance with the official standards 12. Weight Variation: The average weight of twenty tablets which are selected randomly was calculated. Tablet Hardness: Using a Monsanto type tester, crushing strength of tablets was measured. Three tablets were selected randomly and average force which is used for crushing them was recorded. Disintegration Time: Six tablets were taken and employed for the test in phosphate buffer (pH 6.8) maintained at temperature 37 ºC using a tablet disintegration tester. In-vitro Dissolution Study: Dissolution study of roxithromycin oro-dispersible tablets was carried out in USP dissolution apparatus type II in 900 ml phosphate buffer (pH 6.8), temperature maintained at 37 °C at a speed of 50 rpm. 10 ml sample was withdrawn at different time intervals and analyzed using UV spectroscopy at 205 nm. Kinetics Study of Drug Release: To find out the mechanism and kinetics of drug release, the results of the in-vitro drug release study data were fitted with various kinetics equations like Zero order, First order, Higuchi model, and Korsmeyer-Peppas plot. Comparative Study of Optimized Formulation and Conventional Formulation: A comparative study was performed between the optimized formulation and the marketed formulation of roxithromycin tablets [ROXID –Kidtab (Alembic Pharmaceutical Ltd., India)] Dissolution profile was determined for both the formulation using the same procedure as described above. Identification of Drug: Fourier Transform infrared (FT-IR) Spectrophotometry: The IR spectrum of pure drug (Roxithromycin) gives the peaks (cm-1) at 1729.17 due to C=O stretching, at 1010 due to C-O-C stretching, at 1527 due to C=N stretching, at 3681 due to O=H stretching, at 1544 due to N-H stretching, at 1121 due to S=O stretching respectively. The FTIR spectrum of the drug is shown in Fig. 1. Differential Scanning Calorimetry (DSC) Analysis: The drug was further confirmed by DSC analysis and there was a sharp endothermic peak at 130.23°C, which indicates its melting point as shown in Fig. 2. Thus, from the analysis report of IR and DSC, the drug was confirmed as Roxithromycin. Particle Size Analysis: Different formulations for microspheres with the particle size analysis report are shown in Table 1. Percentage Yield, Entrapment Efficiency, and Drug Loading: Table 3 shows the percentage yield, entrapment efficiency and drug loading of batch RMS 1-13. In-vitro Dissolution Rate Studies: The drug release from microspheres for batches RMS 1 - RMS 13 were found to vary from 14.86% to 92.16%. The % drug releases v/s time plots for the formulation is presented in Fig. 3 - 5. From results, all of the batches drug content of RMS-9 batch shows highest drug content compare to other formulation (92.16 ± 2.05). 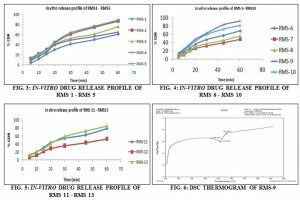 Differential Scanning Calorimetry (DSC) of Optimized Microsphere: From results, all of the batches drug content of RMS-9 batch shows highest drug content compare to other formulation (92.16 ± 2.05). There was a sharp peak at 123.30 °C which is opposite to the melting point of the drug, polymer, and PVA as 146 °C, 160 °C and 180 °C respectively, represented that there was an interaction between drug, polymer and PVA as shown in Fig. 6. FTIR Study of Optimized Microspheres: In FTIR spectrum of the optimized batch, characteristics peaks (cm-1) of C=N at 1527 and C=O at 1742 have not appeared. During the process of preparing the microspheres, the C=N of the drug is converted into C-N and this bonds with the carboxylic hydroxyl groups in the polymer molecules. These types of interactions are useful for masking the bitter taste of drug. Scanning Electron Microscopy (SEM): The SEM study of batch RMS-9 revealed the roxithromycin microspheres to be spherical in shape and uniformity was observed in the size distribution of microspheres. Application of CCD and ANOVA on Drug Entrapment Efficiency: Central composite design was used to study the effect of following two factors on the drug entrapment efficiency. The real values of factors were transformed to facilitate orthogonality of results and easy calculations. If the concentration of Eudragit RS100 is decreased and the concentration of PVA is increased it shows the increase in entrapment efficiency of the drug. To compare the regression mean square with residual mean square F-test was carried out. The ratio F = 38.75 shows regression to be significant. Therefore, for the % of entrapment efficiency was estimated model may be used as a response surface. The 3-dimensional response surface plots are shown in Fig. 10 and the corresponding contour plots in Fig. 11. Precompression Characterization: Precompression characterization results of powder blend are shown in Table 6. Carr’s index was found to be 13.8, the value of Carr’s index was in the range of (11-14) indicating good flow and compressibility. Hausner’s ratio values were found below 1.17 which are in the acceptable limit of good flow indicating low interparticle friction. The angle of repose was found 21.26, indicating good flow characteristics the powder. From the above pre-compression results, it was found that powder blend has good flow. In-vitro Dissolution Study: Orodispersible tablets drug release was found to vary from 34.25% to 93.14%. Drug release data is shown in Table 8. 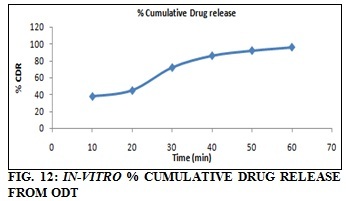 The % cumulative drug release v/s time plots for the formulation is presented in Fig. 12. Drug Release Kinetics Study: To find out the mechanism and kinetics of drug release, the results of the in-vitro drug release study data were fitted with various kinetics equations like zero order, first order, higuchi model, and korsmeyer-peppas plot. 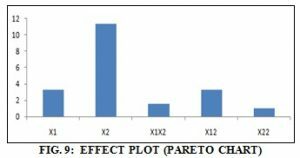 R2 values were calculated from the linear curves obtained by the regression analysis of the plots below. The release profile of first order (R2 = 0.978) was best. Thus, it was concluded that the drug release from oro-dispersible roxithromycin tablets was best explained by the first order model. From the values of correlation coefficient observed after applying different released models to dissolution profile data of tablets, the value of correlation coefficient obtained by first order (0.978) was observed closest to the unity than that of zero order (0.924), higuchi model (0.915) and korsmeyer-peppas model (0.925). So, orally disintegrating tablets follow first order kinetics. CONCLUSION: The roxithromycin microspheres were successfully formulated by using the solvent evaporation method and further formulated into ODTs. The result showed if the concentration of Eudragit RS100 is decreased and concentration of PVA is increased there is an increase in entrapment efficiency and drug loading of the drug. Dissolution study of batch RMS-9 showed maximum drug release 92.16%. The combination of Eudragit RS100 (125 mg) and PVA (562.132 mg) was found to achieve optimum entrapment efficiency and in vitro release. The SEM analysis of batch RMS-9 revealed that the roxithromycin microspheres are spherical in shape and uniformity were observed in the size distribution of microspheres. The size distribution of the microspheres was found in the range of 329.66 to 500.03 µm and the mean diameter was 452 µm. The presence of disintegrating agents MCC and SSG makes it possible to produce the tablet with an average hardness of 4.7 ± 0.24 kg/cm2, and can still disintegrate within 45 ± 0.51 seconds. The ODTs containing drug loaded Eudragit RS100 microspheres improved drug taste and also quickly dispersible tablets. Thus, formulation of Roxithromycin Eudragit RS100 microspheres incorporated in ODTs could enhance patient palatability, especially in pediatric, geriatric and bedridden patients. Sivakranth M, Abdul SA and Rajasekhar S: Formulation and evaluation of oral fast dissolving tablets of sildenafil citrate. 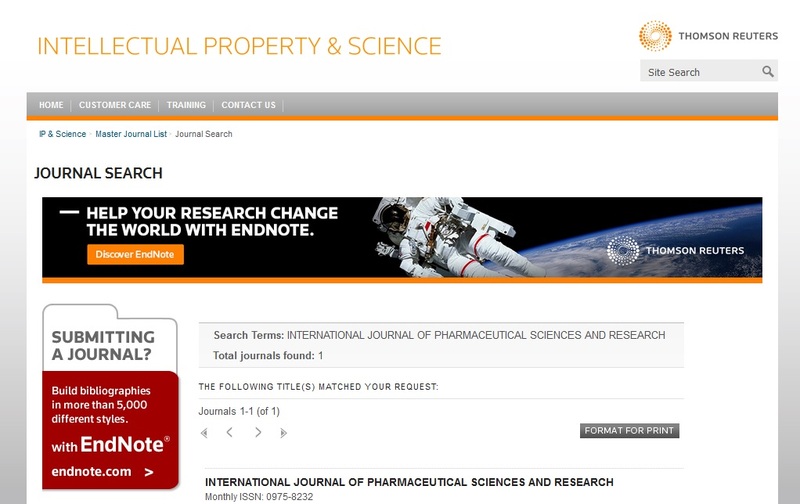 International Journal of Pharmacy and Pharmaceutical Sciences 2011; 3(2): 112-121. Syed IA and Krishna S: Buccal films drug delivery device: A review. Asian Journal of Pharmaceutical Education and Research 2013; 2(3): 1-30. Chiranjib B and Bhowmik D: Fast dissolving tablet: An overview. Journal of Chemical and Pharmaceutical Research 2009; 1(1): 163-167. Kadam NR and Suvarna V: Microspheres: A brief review. Asian Journal of Biomedical and Pharmceutical Sciences 2015; 5(47): 13-19. Reddy CMB and Subbareddy GV: Development, validation and application of UV spectrophotometric method for the determination of roxithromycin in bulk and pharmaceutical dosage form. 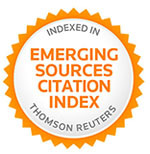 Journal of Chemical and Pharmaceutical Research 2012; 4(7): 3684-3687. Hoa LTM, Chi NT and Chien DM: Preparation and charactersation of nanopartcles containing ketoprofen and acrylic polymers prepared by emulsion solvent evaporation method. Journal of Experimental Nanoscience 2011; 7(2): 189-197. Gao Y, Cui FD and Guan Y: Preparation of roxithromycin-polymeric microspheres by the emulsion solvent diffusion method for taste masking. International Journal of Pharmaceutics 2006; 318(1-2): 62-69. Dahiya M and Dureja H: Central composite designed imatinib-loaded magnetic nanoparticles. Current Nanomedicine 2016; 6(2): 146-155. Anwer MK, Jamil S, Ansari MJ, Iqbal M, Imam F and Shakeel F: Development and evaluation of olmesartan medoxomil loaded PLGA nanoparticles. Materials Research Innovations 2016; 20(3): 193-197. Roxithromycin tablets, Indian Pharmacopoeia. The Indian Pharmacopoeia Commission, Ministry of Health and Family Welfare, Ghaziabad, India 2007; 3: 1679-1680. Cerciello A, Auriemma G, Gaudio PD, Cantarini M and Aquino RP: Natural polysaccharides platforms for oral controlled release of ketoprofen lysine salt. Drug Development and Industrial Pharmacy 2016; 42(12): 2063-2069. Pandey P and Dahiya M: Oral disintegrating tablets: A review. International Journal of Pharma Research & Review 2016; 5(1): 50-62. 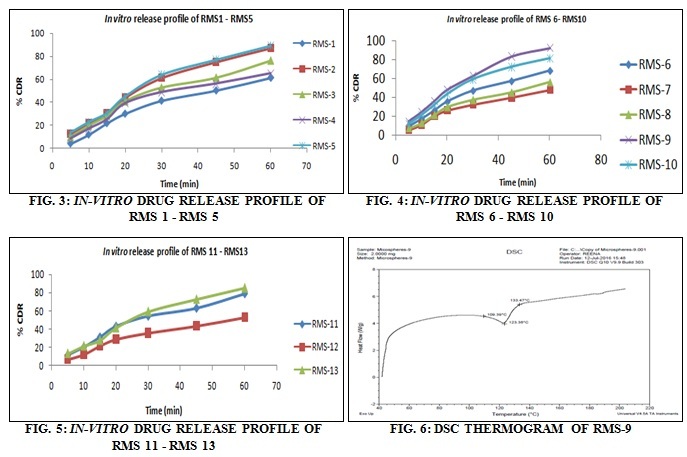 Reena, Dahiya M, Kumar V and Dureja H: Formulation and evaluation of microspheres based oro-dispersible roxithromycin tablets using central composite design. Int J Pharm Sci & Res 2018; 9(11): 4651-58. doi: 10.13040/IJPSR.0975-8232.9(11).4651-58.